Monday UPDATE: Pretty much nailed the number. Demand for 007 was through the proverbial roof and audiences proved that with a $87.8M opening weekend for Skyfall – a new record for the Bond franchise. The Sam Mendes-directed smash has banked $518M worldwide since its rollout began overseas in late October. With an 'A' Cinemascore and the holidays ahead, Skyfall will continue to crush cash for weeks to come. Lincoln was the other huge story with its $900K opening in all of 11 theaters. That's a whopping $81K per theater average, as Steven Spielberg's epic expands to 1,600 theaters Friday. 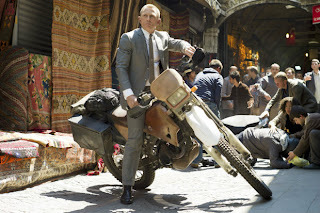 Thanks to the mess at MGM, it's been four years since we last saw 007 on the big screen in the so-so Quantum of Solace. But Bond is back (man, that's trite) this weekend in the ferociously anticipated Skyfall. I haven't been queried about a film with this much vigor since The Dark Knight Rises. And as we saw with the riotous Taken 2, audiences adore action thrillers and this is the best to hit theaters since summertime. Buy your tickets now, a stream of "Sold Out" digital displays should accompany each showing over the next three days. Skyfall $83M - Every once in awhile a film is able to hit the pipeline at precisely the right moment and you get the feeling that Skyfall is that flick. Demand is through the proverbial roof and reviews are nearly unanimous in assessing it's one of the best Bond flicks ever. While an $80-85M opening is my forecast, I wouldn't be shocked to see it push higher. If teens jump on board en masse, the sky's the limit. Wreck-It Ralph $41M - Word-of-mouth for the 8-bit, Mouse House offering is strong and with nothing else in the marketplace for families, anticipate a minuscule weekend-to-weekend drop. Flight $15M - Opened to a stunning $25M on just 1,900 screens as Denzel Washington proves once again to be a box office beast. Too bad the film only soars when it crashes. Argo $8M - The Oscar frontrunner's haul thus far? $79M and counting. Otherworldly holding power. The Man with the Iron Fists $4.5M - Decent opening considering the lack of any expectations. Also: Lincoln - Steven Spielberg's slice of the 16th president's life opens on 11 screens before expanding next weekend. Given the buzz, it will put up a prodigious per-theater average, but I can't see it topping The Master's all-time record of $146K per. Either way, Daniel Day Lewis is a virtual lock for Best Actor at the Oscars.